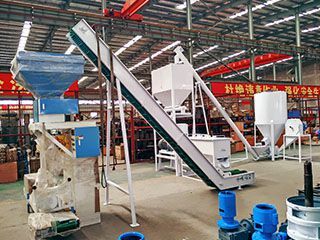 Process Flow: Feedstuff crushing, mixing, pelletizing, cooling and packaging. 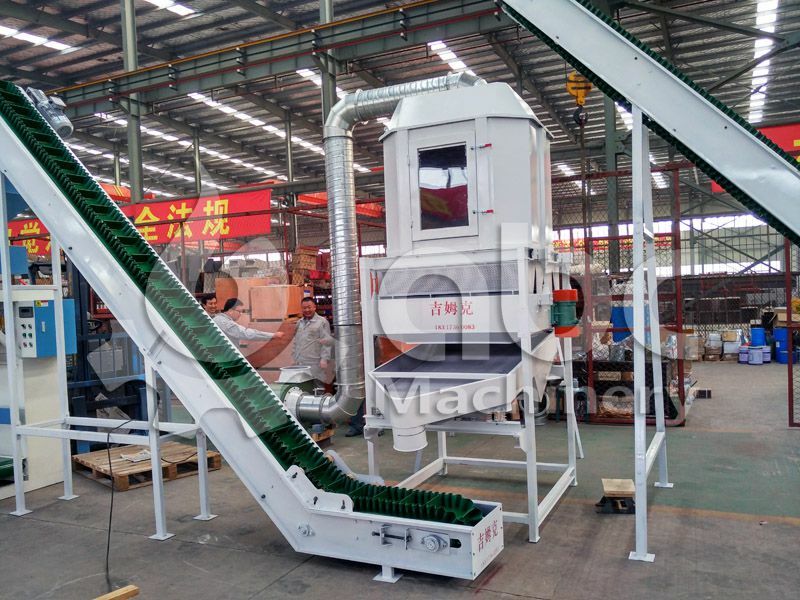 Application: This complete production line of livestock feed is specially designed for making various feed pellets for cud chewer or ruminate animal such as sheep and cattle. 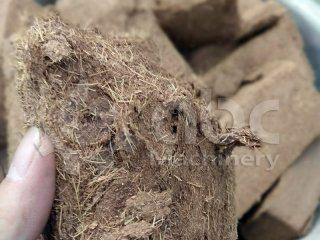 The raw material for livestock feed come in varied sizes and forms and so have different storage requirements. 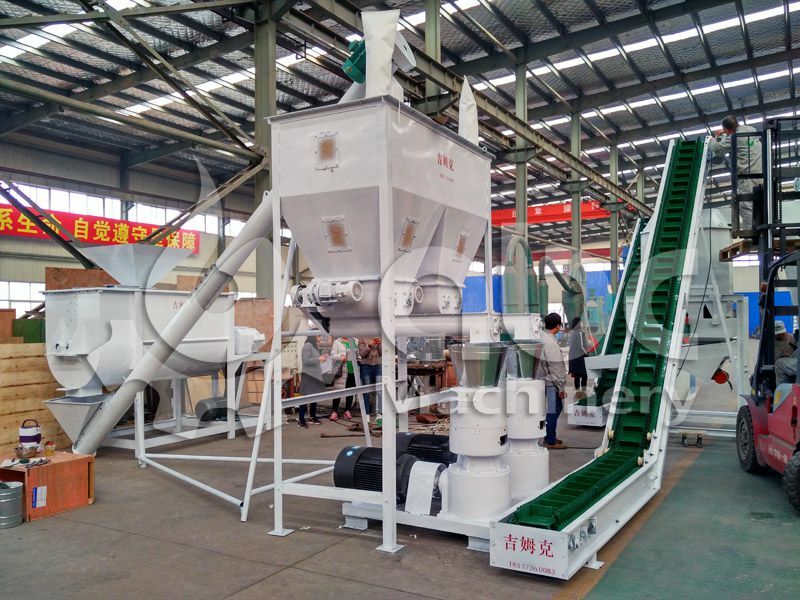 Long raw material like crop straw need pellet line of large capacity and storing grains like maize and wheat require silo storage. 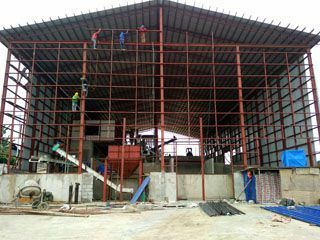 The pure raw material is important not only for the quality feed products but also for keeping the equipment functional and thus efficient feed production as well as for the safety of the personnel. Large and long impurities (stones, mud blocks, etc.) should be removed by screening equipment and iron impurities should be removed by the magnetic separators. 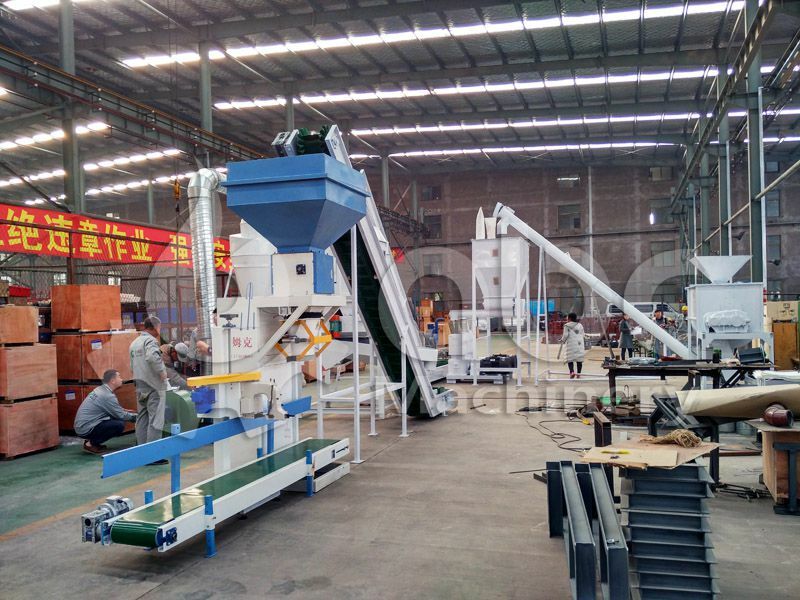 Depending upon the required fineness and variety of feed, the crushing process is determined from either one-stage crushing or two-stage crushing. 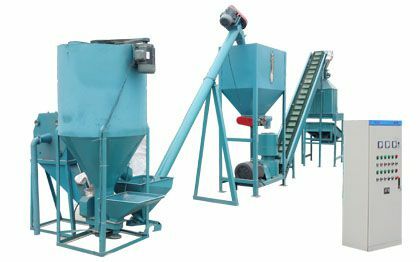 Batching before crushing or crushing before batching is also dependent on the form of the batching. 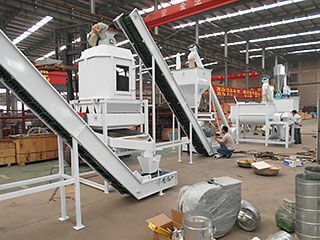 Manual and Volumatic batching are the most common batching processes. 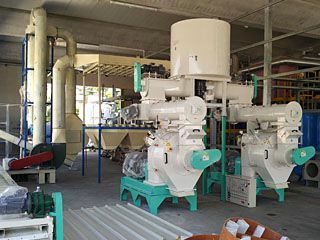 Small feed pellet plants and medium feed pellet plants with the capacity of 1-15T/h use manual batching where workers weigh feed material manually and pour into the mixing machine. 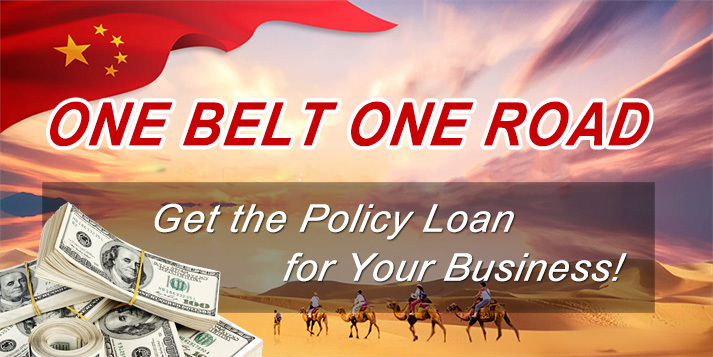 Since the process is manual it requires less investment and has low production cost. 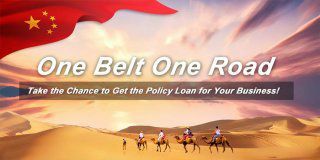 It’s a flexible and precise measuring method. Batch mixing and Continuous mixing are the two ways mixing can be done in two ways. 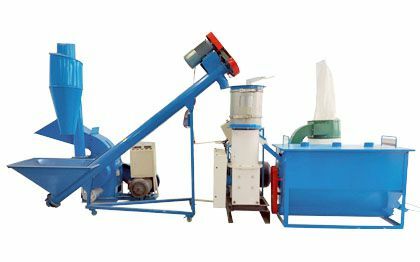 In batch mixing, all components are blended together in the specified proportion as per the formula and then mixed in the batch mixer. 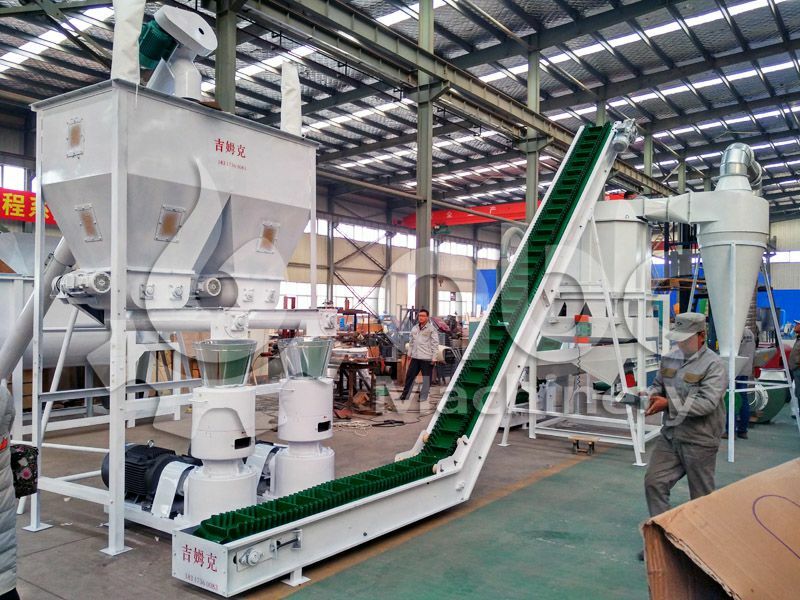 The convenience of replacing the feed formula and the lesser batch intermixing makes this method quite common. 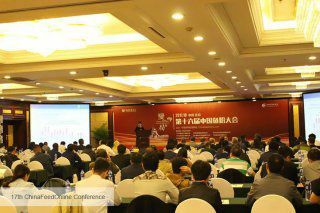 However, the complex operation of starting and stopping encourages the usage of automatic program control. 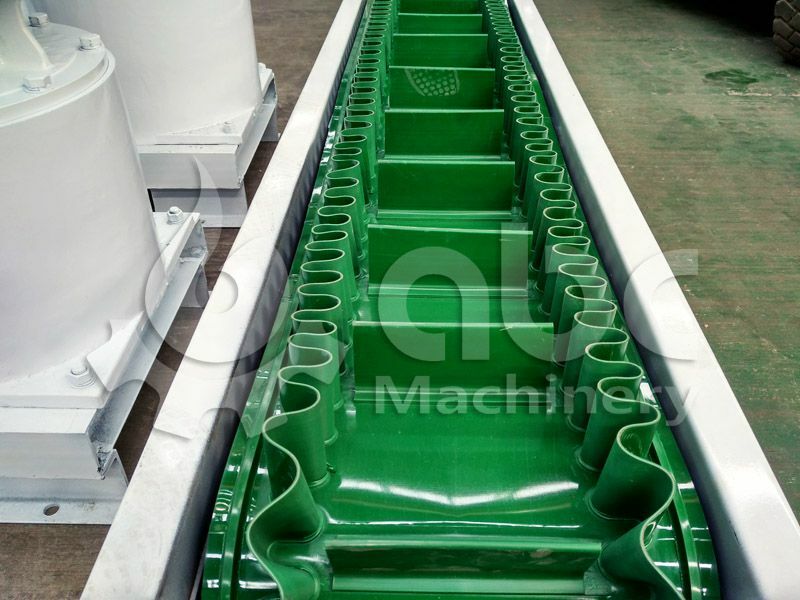 At the entry in a continuous mixer, the feed is mixed continuously at the same time into a uniform flow of material. 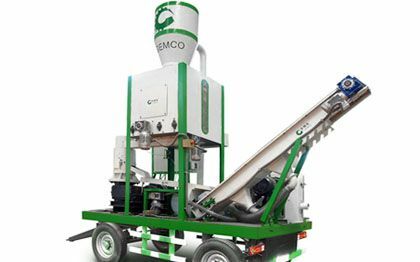 This process has an advantage of being able to continuously be carried out with comminution and granulation thus, requiring a less frequent operation. However, in the event of formula change, the flow adjustment is complex and leaves more residue in the equipment and so creates more intermixing of batches. 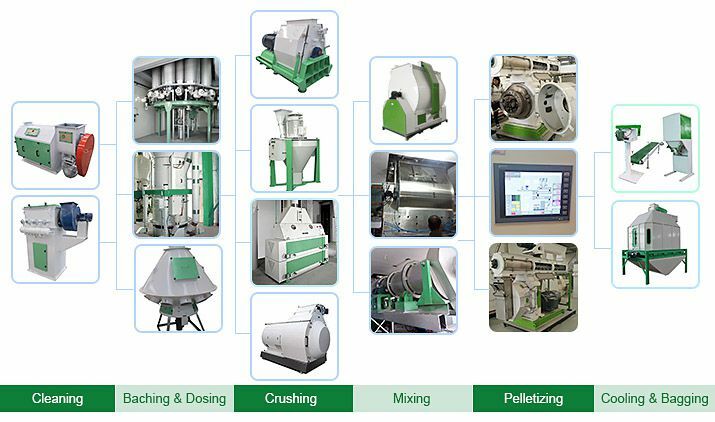 Two different kinds of machines are used according to the capacity - flat die feed pellet mill and ring die feed pellet mill. Flat die type is used in small animal feed plants with the capacity of 600-1000 kg /hr. 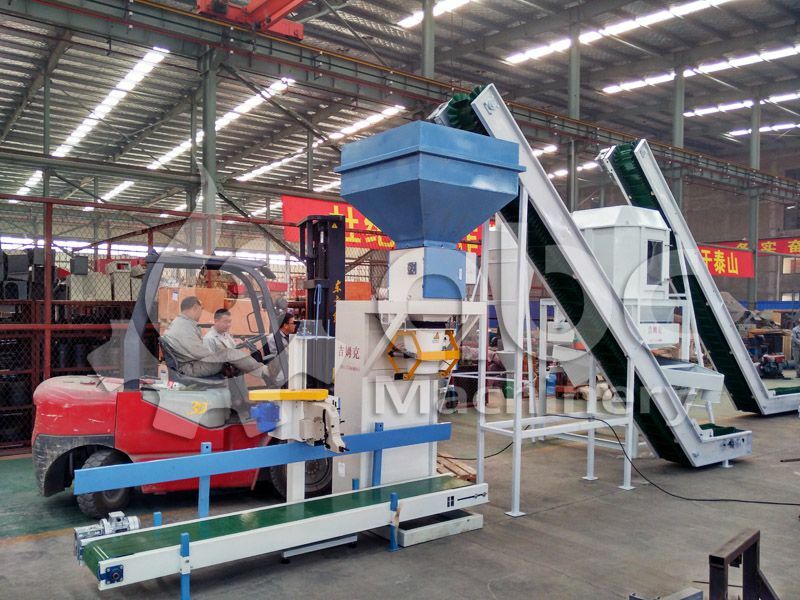 In this machine, rotating roller and flat die press the evenly distributed mixed feed. Which then passes through flat die holes and form cylindrical granules. Cutting blades cut them in specified sizes as per length and diameter size requirements which then are discharged from the outlet. Ring die type is used in medium to large plants with the capacity of 1-15T/h. 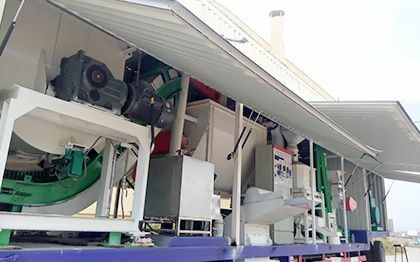 In these machines, before the feed material is evenly distributed between roller and ring die, it is conditioned via a conditioner placed on the top. Conditioning helps in moisturizing the feed. 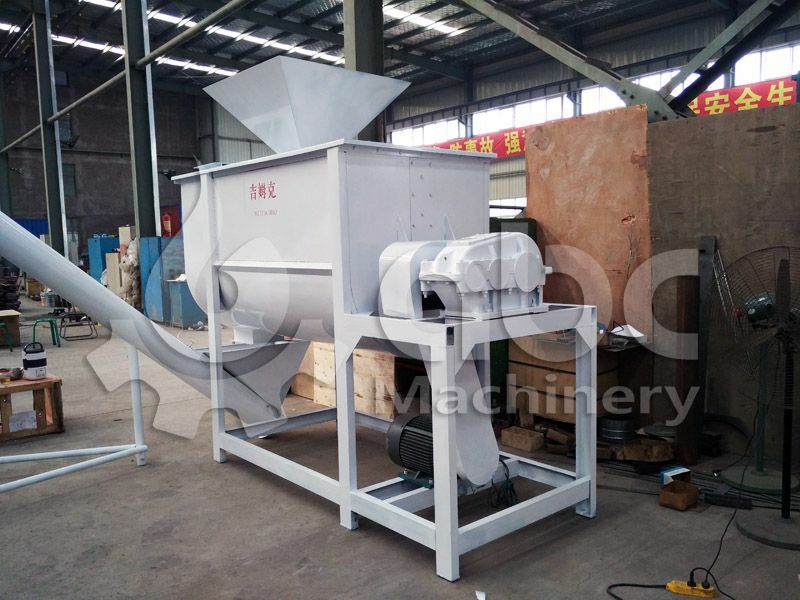 The pelletizing requires feed with high temperature and humidity. The quizzing adds more heat resulting 16-18% moisture feed with a temperature of 75 – 85 C. such high temperature and moisture make deformed and broken feed which would bond and mildew in storage. Cooling is required to reduce the moisture to 14% and temperature below 8 C.
Crumbling reduces feed pellets size for young livestock. 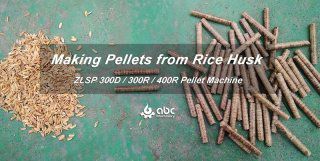 Often manufacturers make specified sized pellets to save electricity, increase outputs and improve quality. However, it’s not mandatory. 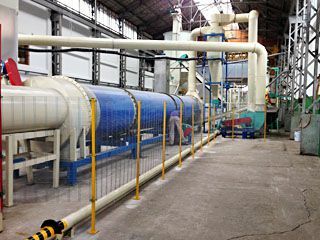 Cooler in small feed plant and crumbler in medium to large feed pellet plant screens the feed. 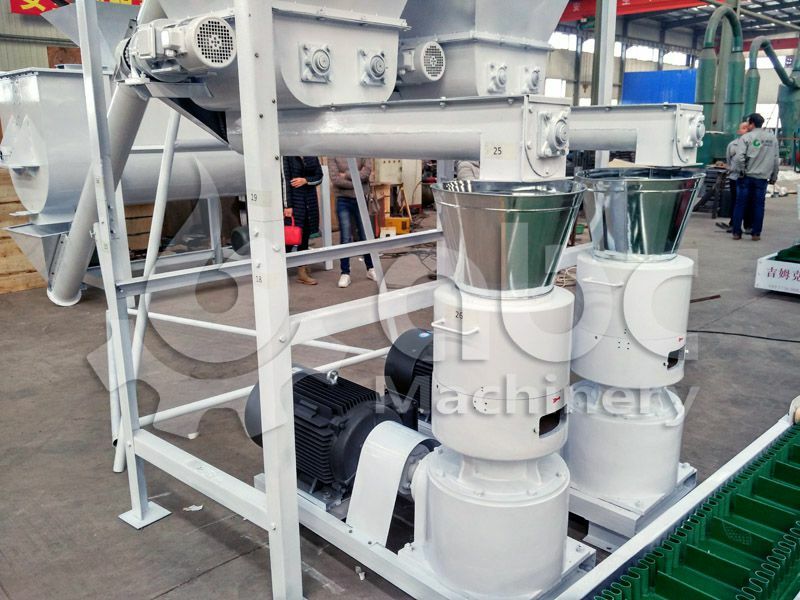 Using crumbler also requires pellet sieving machine to separate powder from feed pellets and to deliver uniform deed pellets for packaging as well as sending powder and ineligible pellets back for reproduction. The final stage is the packaging of the pellets for distribution.